To claim this profile, please confirm you are Sanaisha Morgan. To follow this profile, please let us know your relationship to Sanaisha Morgan. 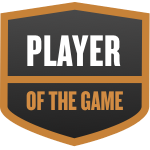 Sanaisha was selected the Player of the Game in the basketball game against Canyon Springs on Thu, Feb 07 2019. Sanaisha's basketball stats have been updated for the loss vs. Roosevelt. The Cajon varsity basketball team lost Saturday's neutral playoff game against Roosevelt (Eastvale, CA) by a score of 75-40. Sanaisha's basketball stats have been updated for the win vs. Canyon Springs. The Cajon varsity basketball team won Thursday's neutral playoff game against Canyon Springs (Moreno Valley, CA) by a score of 60-52. Sanaisha's basketball stats have been updated for the win @ Carter. The Cajon varsity basketball team won Thursday's away conference game against Carter (Rialto, CA) by a score of 56-41. Sanaisha's basketball stats have been updated for the win vs. Yucaipa. RESULTWin Girls varsity basketball vs. Yucaipa. The Cajon varsity basketball team won Tuesday's home conference game against Yucaipa (CA) by a score of 43-42. Sanaisha's basketball stats have been updated for the win @ Citrus Valley. RESULTWin Girls varsity basketball @ Citrus Valley. The Cajon varsity basketball team won Thursday's away conference game against Citrus Valley (Redlands, CA) by a score of 70-38. Sanaisha's basketball stats have been updated for the win @ Redlands. RESULTWin Girls varsity basketball @ Redlands. The Cajon varsity basketball team won Tuesday's away conference game against Redlands (CA) by a score of 59-10. Sanaisha's basketball stats have been updated for the win vs. Redlands East Valley. RESULTWin Girls varsity basketball vs. Redlands East Valley. The Cajon varsity basketball team won Thursday's home conference game against rival school Redlands East Valley (Redlands, CA) by a score of 59-36. Sanaisha's basketball stats have been updated for the win vs. Carter. The Cajon varsity basketball team won Tuesday's home conference game against Carter (Rialto, CA) by a score of 66-24. Sanaisha's basketball stats have been updated for the win @ Yucaipa. RESULTWin Girls varsity basketball @ Yucaipa. The Cajon varsity basketball team won Thursday's away conference game against Yucaipa (CA) by a score of 59-48.